There is no question that traveling to a country where you cannot read, speak or even remotely understand the language can be intimidating. The language barrier can make communicating with others, getting from Point A to Point B or simply finding an internet connection more difficult than usual. However proper planning, combined with smart usage of technology, makes overcoming a foreign language barrier easier than you might think. Astrid Solo Travel Advisor founder, Astrid, is currently in Japan, where she will be spending the next three weeks traveling across this beautiful country during the heart of cherry blossom season. (Read her travel itinerary overview here.) Regardless of whether you are a seasoned traveler or a solo travel novice, visiting an entirely foreign land can be unnerving; but it doesn’t have to be. If you are planning on taking your own trip to The Land of the Rising Sun, here are a few practical tips on visiting Japan to help you start planning and preparing. How is it possible to accomplish anything in a foreign country when you have no idea what anyone is saying, it’s impossible to decipher the street signs and you can’t even figure out which button to press on the toilet? How can you bridge this language gap? While this is not necessary, I feel that it is important to remember that when you travel outside of your home country, you become the foreigner. As the guest, it is your responsibility to make an effort to understand and communicate with the residents of your host country. Though not many Japanese people speak English very well, most understand some English. Furthermore, as kind-hearted as the Japanese may be, people will generally be more willing to help you if you treat them with grace and respect. The best way to show this is by attempting to speak their native tongue. This article has a great breakdown of a few simple Japanese words and phrases that might come in handy as a traveler. Yes, you can you use Google Translate to convert written text, but more importantly, the app can also be used to generate a spoken translation. This means that you could ask someone a question in English, which Google Translate will then convert to Japanese. Then, when the person answers your question in Japanese, Google Translate will output the response in English. While not totally seamless or 100% accurate, this makes asking someone a simple question such as, “What meat is in this dish?” much quicker and easier. Perhaps its greatest feature, Google Translate can also be used to instantaneously translate images of menus, street signs, maps, etc. This is quite the handy feature when even the alphabet looks unfamiliar. Important: Pre-download the Japanese language in the Google Translate app so that you will be able to use the app even while offline. To read my list of 6 other useful apps you can use while offline, click here. As an added tip: Write down the name of your hotel in Japanese. If worse comes to worst and you become horribly lost, you will at least be able to show someone where you need to go. Navigating public transportation is a big stressor for many solo travelers, myself included. However, the situation becomes much less overwhelming when you break it down. Solve one problem at a time. First, orient yourself on a map and figure out where you are. Pinpoint where you need to go. Use a navigation app to help you decide on your method of transportation. Google Maps will even give you step-by-step instructions including which way to walk to the nearest station or bus stop, how to make any transfers, and where to exit. Order any passes you will need ahead of time. This way, you won’t have to worry about purchasing tickets at a station. Make sure you get on the right train/bus/etc. Evidently, the trains in Japan are incredibly punctual with some of them arriving every 2 minutes during the busiest times. 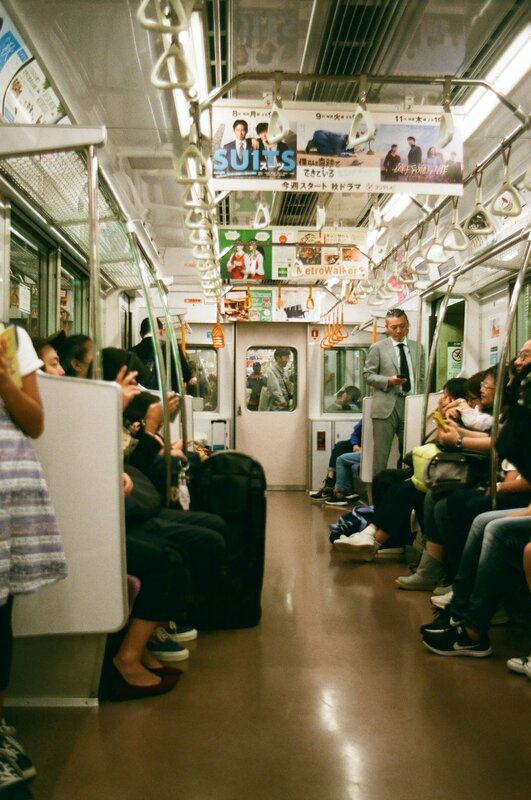 To make life a little easier, the trains in Japan are normally color-coded. Give yourself plenty of time, and do not panic if you discover you have gotten on the wrong train/bus/etc. You can always get off at the next stop and go back the way you came. Once you break down how a public transportation system works, getting around begins to seem much more manageable. What is the Japan Rail (JR) Pass and should I buy one? The JR Pass is an unlimited pre-paid pass used mainly to travel between cities in Japan. It is not cheap, but deciding whether or not you should purchase one will depend on your travel itinerary. If you will be staying in Tokyo the entire time, purchasing a JR Pass is probably not necessary. Astrid will be doing a lot of traveling between 6 different cities, thus purchasing a JR Pass was the wisest, most cost effective decision. If you will be traveling between multiple cities, my advice would be to calculate your estimated round-trip fare between each of your destinations using the JR Fare Calculator and compare the cost of purchasing single trip tickets to purchasing an unlimited JR Pass. The JR Pass includes unlimited rides on any Japan Rail train (including all but 2 bullet trains), bus or ferry. Passes can be purchased for use over either 7, 14, or 21 consecutive days. The cost starts at $263 USD for a 7-day pass. The JR Pass should be purchased online before you arrive in Japan. It is possible to purchase a JR Pass at some airports and train stations in Japan, but they will be more expensive. What about traveling within cities? What “private lines” means is any transportation service operated by a private company. Generally, the subway and busses are run by companies other than JR. The best way to deal with this confusing situation is to purchase a SUICA card, which can be used among different transportation companies. A SUICA card costs about $5 USD and can be loaded and reloaded with money to cover the cost of your tickets. This is a very helpful video which explains a bit more about how the Tokyo public transportation system works! Travel Tip: Pre-download maps within the Google Maps app to use offline. Even if you do not have internet, you can still use Google Maps as long as you download maps of your desired area ahead of time. Here is a list of 7 Useful Apps for traveling in Japan! The trains do not run all night. While we do not recommend being out excessively late as a solo traveler (even in a country as safe as Japan), know that if you do choose to stay out into the wee hours of the morning, the trains will not be running and you will likely have to take a cab back to your hotel. Watch this quick video for a few helpful tips on train etiquette! While I am a big proponent of being “unplugged” while traveling, you will need to use your phone, and access the internet for a number of practical reasons while visiting Japan. You will need to use data or wifi to use any apps that help you with navigation and generate up-to-date train/bus/subway timetables. Furthermore, you might want to search for nearby attractions, or you might need to contact a loved one back home. In addition as a solo traveler, your phone functions somewhat as a safety device. It helps you stay aware of where you are and where you’re going, which makes you less of a target. Thus, being completely “off the grid” while traveling is not reasonable. So what can you do? There are a number of SIM cards you can purchase in Japan that will give you either a pre-set amount of data, or even unlimited data to use over a specified period of time. One of the best deals I came across was this one from Experience Japan through the JR Rail Pass website. This is a data only SIM which means you can’t make phone calls, but you can still use apps like FaceTime or Skype to make voice calls. Note: Your phone HAS TO BE UNLOCKED in order for a SIM card to work. You can check online through your service provider to find out whether or not your phone is eligible to be unlocked. Generally your phone has to have been paid off before it is able to be unlocked. If you purchased your phone through a payment plan and you still have a balance left on your phone, it is likely that you will not be able to use a SIM card in Japan. If this is the case, your other option would be to purchase Pocket Wifi. While a bit more expensive than purchasing a SIM, a pocket Wifi device is a small, lightweight device which you can use to connect up to 10 devices to the internet through a high-speed Wifi connection that you carry with you. Watch this video explaining how to use Pocket Wifi in Japan! Many establishments in Japan do not accept credit cards. Make sure you are prepared and have plenty of cash on hand. If you are worried about the risk of theft while carrying around large sums of cash, consider buying a money belt or even a secret “bra wallet” and only keep the money you think you will immediately need in your regular wallet. If you need an ATM, try a 7-Eleven as and they are open 24/7 and their machines are known for being reliable. Do not tip in Japan, even if you think the service is excellent. Here is a great article explaining tipping etiquette and how to handle the few exceptions to this rule. While not meant to be an exhaustive guide, this should give you a general idea of the logistical planning that is required when considering a solo trip to Japan. I hope that this post has given you an idea of how you might be able to visit a foreign country despite the apparent language barrier. You might even begin to think of a language difference as less of a fixed barrier, and more like a hurdle you simple have to learn to jump over. Stay tuned for more posts and advice from Astrid Solo Travel Advisor founder, Astrid, on Cherry Blossom season in Japan, must see sights, cultural tips and more. Follow along with the journey in real-time on social media! Click on the links below! Madeline joined the Astrid Solo Travel Advisor team as a Content and Digital Marketing Manager in 2018. She believes that traveling is an essential aspect of life that allows you to see yourself, other people, places and things in a new light. She is passionate about trying new things, having a curious mind and seeking joy wherever she goes.